If you have NTS version 3.60 or before, please see the instructions for older versions of NTS. From the Checkbook screen, click on Setup and then Expense Acct List. To change a budget, click on the budget amount and then type in the new budget. Click on another budget amount or press Enter to save the changes. To cancel a change, press the Esc key before pressing Enter. For NTS versions 5.30 and above: If there are designated funds that should be excluded from the budget, select the corresponding internal account in the "Exclude from Budget" box. Expenses paid from the selected internal account and charged to the selected expense account will not be counted against the budget. 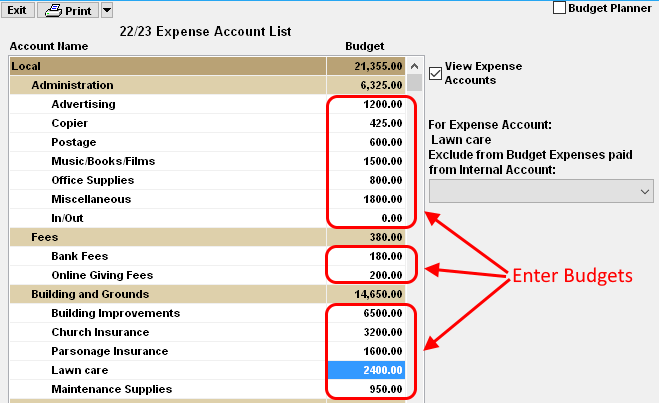 Expense accounts are listed by Expense Category and group. The budgets for the categories and groups are automatically calculated by adding the budgets of all accounts within each category or group. There is money left over from last year, that will be spent this year in addition to the money we will raise this year.